There is no entry fee to enter the competition. I’m 16 years old, can I still enter? If you will be 16 or under on the 10th February 2019, yes. I’ve got into the final 40! What now? Keep an eye on this website where the final 10 will be announced. If you reach the final 40 it is a VERY good idea to prepare a 200 word bio about yourself in Word format with a good quality head and shoulder photo. If you reach the final 12 you will need to supply these items almost immediately. Should my face be clearly visible in my entry? TOTALLY!! We need to be absolutely sure it’s you. If we can’t, the entry is disqualified. Can you tell me why I didn’t make it into the final 40 or the final 10? Yes, because you were not as good as those who got into the final 40 or final 10. Can I send in a video of me playing along to a backing track? You can have backing music if you want but if the track does not allow for a substantial solo (>50%) or if it’s so loud we can’t hear you playing, you’re placing yourself at a disadvantage. We normally get 400+ entries. We look at them all and whittle them down to 40. We then sent those 40 tapes around to five or six professional drummers and teachers to mark their favourite 10. All responses are collated and the final 10 are chosen. Those 10 finalists battle it out at the finals. Are you going to do video clips of the 10 finalists this year? How are the finalists marked? Each finalist is marked out of 10 on 6 separate competencies. The finalist with the most points is the winner. Who is on the judging panel at the finals? That’s a secret! 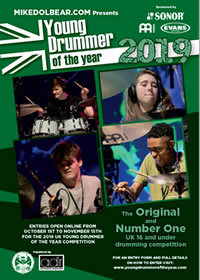 However, past judges have included Vic Firth, Derek McKenzie, Geoff Dugmore, Ralph Salmins, Sola, Jason Bowld and Lloyd Ryan. Do I have to have my kit set up for my entry as I will in the finals? No. Have your kit set up as you like for your entry. But make sure we can clearly see you. What are the judges looking for in the finals? The judges will be marking on such things as timing, technique, using your ears, feel, playing for the music and your general attitude. What’s the format on the day of the finals? Each finalist has to play a two minute solo, they then have to play a song with a bass and guitar player which will have been provided about three weeks before the finals. Finally they have to play a piece of music with the guitar players which they are only introduced to on the day.